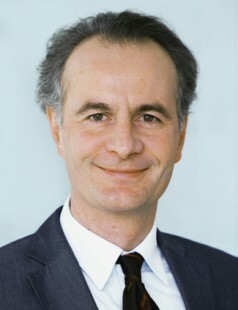 Prof. Dr. Elgar Fleisch is professor of information management at the Zurich University of Applied Sciences, professor of technology management at the University of St. Gallen (HSG), and the director of that university’s Institute for Technology Management. The World Wide Web is on the verge of its next revolution. Experts are predicting that by the year 2020 some fifty billion technical devices will be interlinked via the Internet. This new concept, the “Internet of Things”, is a source of fascination for technicians, researchers and visionaries. The omnipresent networking of the real and virtual worlds, also known as “ubiquitous computing”, has already reached many areas of life. Included here are intelligent electric meters that switch on the home washing machine, sensor-regulated irrigation of agricultural fields, and condition monitoring for machines and equipment. In addition to many technical challenges, it is also worth considering the effect this third IT revolution will have on the economy, on society and on people as a whole. To find answers, drive&control questioned Prof. Elgar Fleisch, Ph.D., the scientist and researcher who co-authored the standard reference work entitled The Internet of Things. Professor Fleisch, the Internet of Things is being touted as the third information technology revolution. In which industrial applications has this revolution already made the greatest progress? Firstly, wherever fine-grained information about the physical world – which can now be economically collected by way of technologies found in the Internet of Things – are of value for business. These include production control (in manufacturing and agriculture, for example), condition monitoring (from blood banks to bridges), logistics for containers and individual components, anti-counterfeiting concepts, access systems, and payment processes. The second area is where information can beneficially influence human behavior, such as in conserving energy and drinking water, or promoting health. Where, in your opinion, are the greatest technical challenges to be found? Essential to the Internet of Things are infinitesimal computers that can be built into almost any everyday object. This turns those objects into “smart” devices. Nanocomputers like this will have to be able to collect, evaluate and transmit wirelessly – if at all possible without an external energy supply. The energy autonomy of “smart” things is a central challenge. A second nut that will be almost harder to crack – because it can’t be mastered on a purely technical level – is the lack of communications standards for the “last mile”. That is in fact the last meter or even millimeter between the “smart” things and a node in the classical Internet, fitted with a power connection and the time-tested TCP/IP protocol. But agreeing upon a worldwide standard for this last mile seems to be just about as impossible as establishing Esperanto as the international language. The Internet of Things will trigger many profound changes. How can both the business world and society prepare for the upcoming changes and improve the prospects for acceptance? To my way of thinking, the Internet of Things will emerge in business and society in a process that will be more evolutionary than revolutionary. I wouldn’t be expecting any radical changes within any short periods of time. In the past we discovered that we can, indeed, predict the coming decade’s technologies with amazing accuracy. But we have little luck at forecasting their applications. Prematurely hyping a new technology as a panacea or denouncing it as the devil’s handiwork has never helped any national economy. And we are aware that there are two sides to every technology, from a bread knife to hydroelectric power. We know that people accept new technologies when the perceived utility is felt to be greater than the perceived risk. That is why it is advisable to feel out every new technology, step by step, without bias, courageously, and fully aware of our responsibilities. Only in that way can the technology be shaped and applied to society’s best benefit. One application for the “Internet of Things” is remote condition monitoring, implemented in the Rexroth IndraMotion MTX CNC concept. It permits early detection of damage and wear in machine tools. Critical events or unacceptable loading conditions are automatically recognized. At the same time, continuous monitoring makes it possible to use component service lives to their fullest extent. Unscheduled downtimes are avoided and machine availability rises. The basis for giving the “things” in the machine affordable Internet access is the PC that is normally present. Additional modules include data acquisition devices, motion controllers and the like, CNC, PLC, and intelligent field bus devices – like the IndraDrive drive system. These smart components not only acquire their own data – their own operating mode or malfunction status, for instance – but also data for neighboring “dumb devices” (like an odometer for a for ball-screw linear drive). This information is then processed at the PC, readying it to be passed along to the Internet. The communications standards required here have in large part already been agreed upon in the field of automation technology, at least in regard to transmission by wire. SERCOS and PROFINET are to be mentioned here in conjunction with real-time applications, while the standardized OPC and OPC UA web services can be used for the “softer” real-time operations. Additional building blocks needed for the future expansion of the “Internet of Things” include the use of existing IT infrastructures for additional monitoring functions, mobile applications for tablet PCs and smartphones, and component networking. One example of the latter would be a hydraulic cylinder with an integrated sensor that sends data wirelessly to an evaluation unit. There are certain challenges that will have to be mastered, especially in terms of communications standards and energy autonomy.